The world of WWE is a strange and wonderful place full of strange and wonderful personalities. Sometimes, instead of fighting, those personalities team up to create tag teams. It is in this violent world of tag team wrestling that the sport reaches its most exciting heights. Below is our list of the greatest WWE tag teams ever assembled. You won’t believe who Chris Jericho used to fight alongside! During the 1980’s no professional wrestlers were more popular than Hulk Hogan and Randy “Macho Man” Savage. 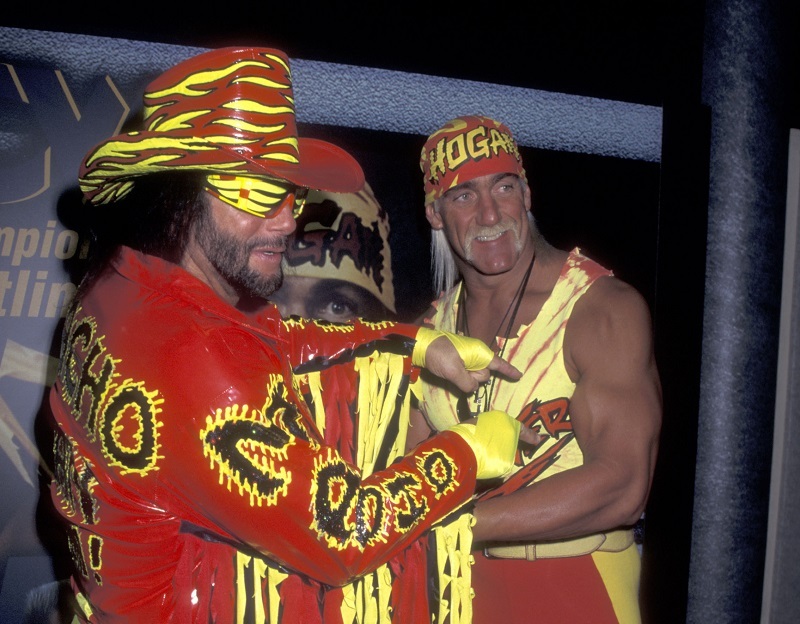 Instead of forming what would have been one of the greatest rivalries at the time, the two decided to join forces and become the Mega Powers. The Mega Powers made their official tag team debut at SummerSlam in 1998, taking on Andre the Giant and the Million Dollar Man for the title. 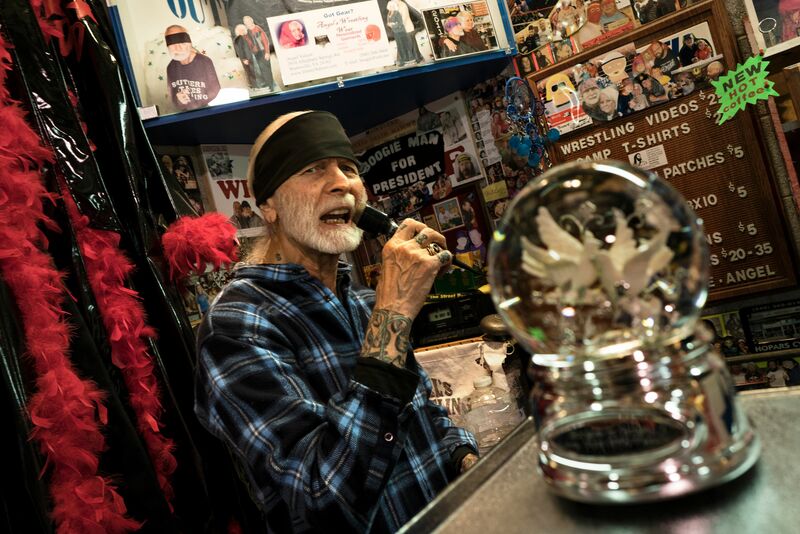 They overcame their overwhelming opponents, as well as bias from guest referee Jesse “The Body” Ventura (a rival of the Macho Man) to take home the title. The Mega Powers blew their chance to become the greatest tag team duo of all time after Randy Savage had a sudden change of heart regarding his valet’s closeness with Hogan. Bound to each other through a family marriage, Bret “Hit Man” Hart and Jim “the Anvil” Neidhart become one of the most feared tag teams in the late 1980’s and early 1990’s. Usually dressed in pink or other “soft” colors, the Hart Foundation were anything but. Bret Hart was one of the most technically sound WWE stars of his time. Neidhart complimented him with pure attitude and rage. When they were at the top of their game, the Hart Foundation was nearly impossible to stop. In 1987 and 1990 they went on extended Tag Team Title runs that left their competitors shaking in the speedos! Our next team dominated every level, from AWA all the way to WWE! Known as one of the most dominant tag team in wrestling history, the Legion of Doom found success at every professional level. They made their WWE debut in 1990 and won the World Tag Team Championship at SummerSlam in 1991. The title made them the only team in history to win Championships in all three “promotions” of wrestling at the time; the American Wrestling Association, the National Wrestling Association, and the World Wrestling Federation (now WWE). Unfortunately, their popularity quickly faded and they were out of the WWE by 1992. They returned briefly in 1997, even winning another Tag Team Title, but once again could not find sustained popularity with fans. 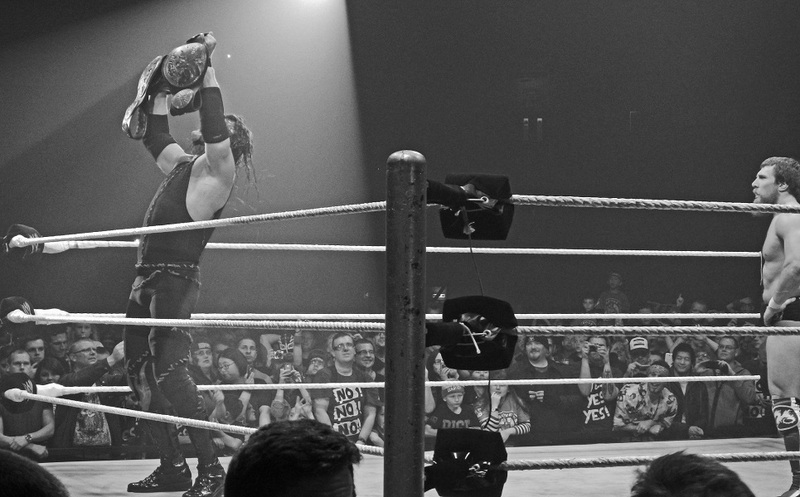 The Hardy Boyz, like D-Generation X before them, were an integral part of WWE’s “attitude era.” Known individually as Matt and Jeff Hardy, the pair wrestled with reckless abandon, oftentimes putting their bodies on the line in pursuit of titles. 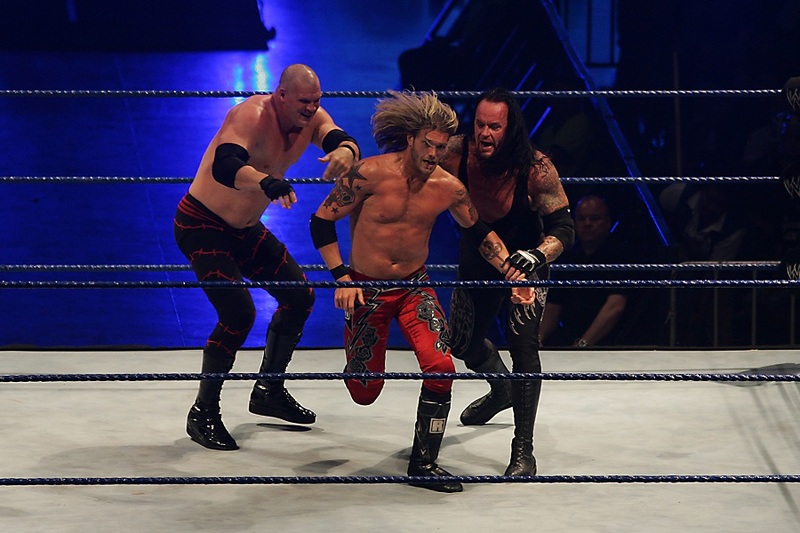 At their peak, the Hardy Boyz were embroiled in a six-headed rivalry with the Dudley Boyz and Edge and Christian. During their matches, the Boyz made it their goal to find new ways to use ladders, tables, and chairs as weapons. No one in WWE quite knew how to handle the Hardy Boyz, and the team won numerous Tag Team Titles together before moving to TNA in 2010. The pair returned to WWE action in 2017. During the 1990’s the WWE went through what is known as the “attitude era.” No tag team defines this period better than D-Generation X. Wrestling together for 13 years. best friends Shawn Michaels and Triple H became one of the most recognizable tag teams in history. In fact, D-Generation X became so popular and powerful within that WWE community that their influence began spreading outside the ring. At one point they were even able to recruit Mike Tyson to join their group! Despite their immense popularity, D-Generation X won their first Tag Team Title in 2009, reforming from an eight-year hiatus. Unlike D-Generation X, the Brothers of Destruction hated each other, until they didn’t, so the cycle goes. Kane had a number of Tag Team partners throughout his career, but his relationship with the Undertaker was the one that made the most sense. An uneasy pairing between the Undertaker and Kane, this duo dominated the tag team circuit when they weren’t stabbing at each other’s throats. Brothers in real life, oftentimes their sibling rivalry got in the way of their tag team dominance. When they were able to set their differences aside, the Brothers of Destruction were unstoppable, stomping over the likes of Edge and Christian and KroniK to win Tag Team Titles. During sporadic tag team runs, the Brothers of Destruction claimed three Tag Team Championships. During their run, Edge and Christian were more than able to back up their arrogant attitudes, winning a total of seven Tag Team Titles and competing in the first ever Table, Ladder, and chair match with the Dudley Boyz and the Hardy Boyz. Forming a rivalry between both tag teams, Edge and Christian never backed down, usually winning and proving they were a force to be reckoned with. 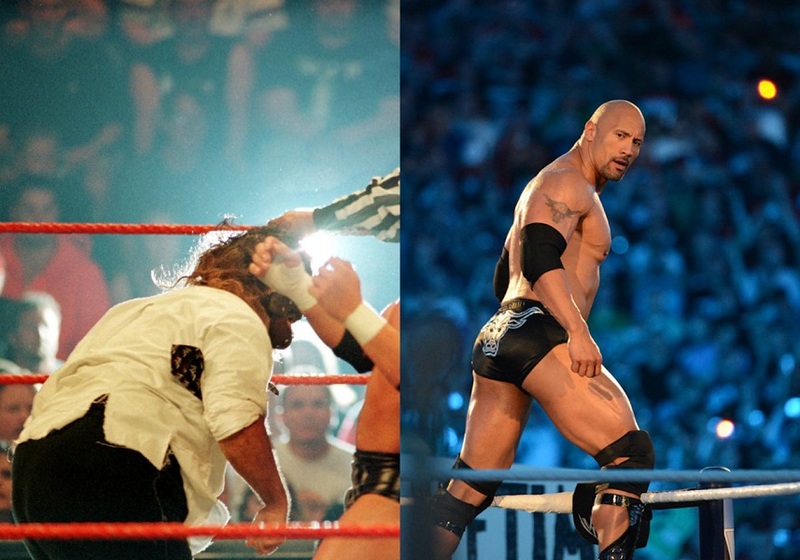 The Rock ‘N’ Sock Connection was a tag team consisting of the odd pairing of the Rock and Mankind. The Rock, better known today by his surname Dwayne Johnson, was known, at the time, for his immaculate grooming and love for gold chains. Mankind, on the other hand, was a psychotic barbarian who wore a leather mask and talked to a sock. Not a sock puppet, a sock. Together, The Rock ‘N’ Sock Connection became one of the greatest tag teams of all time. They won the Tag Team TItle in their first match together and went on multiple tag team runs after. During their peak, they were so popular that WWE Raw saw television viewership grow by the millions! Despite being one of the evilest WWE superstars of all time, Kane was also one of the most successful tag team partners ever. The problem was, he could just never stay loyal to one partner! After splitting from X-Pac, Kane formed another unlikely bond with Daniel Bryan, a lesser known spark plug who looked like a lumberjack on steroids. During their run, Team Hell No formed rivalries with heavyweights The Shield and Team Rhode Scholars. Popular in the ring, the pair was actually most popular for their side-segments outside of the ring. Playing off their tough guy images, Kane and Bryan went to anger management sessions together lead by Dr. Shelby. The memorable segments usually ended with both wrestlers hugging and crying. We promise, there was no crying and making up from our next team! Sporting mohawk mullets and motorcycle boots, it’s hard to find a more redneck tag team than the Nasty Boys. Coming straight out of Allentown, Pennslyvania, Jerry Sags, and Brian Knobbs loved to make people hate them. They also loved playing dirty. Their most famous dirty play came during Wrestlemania VII, when Sags grabbed Jimmy Hart’s motorcycle helmet and hit Jim Neidhart upside the skull, earning the Nasty Boys the World Tag Team Title. 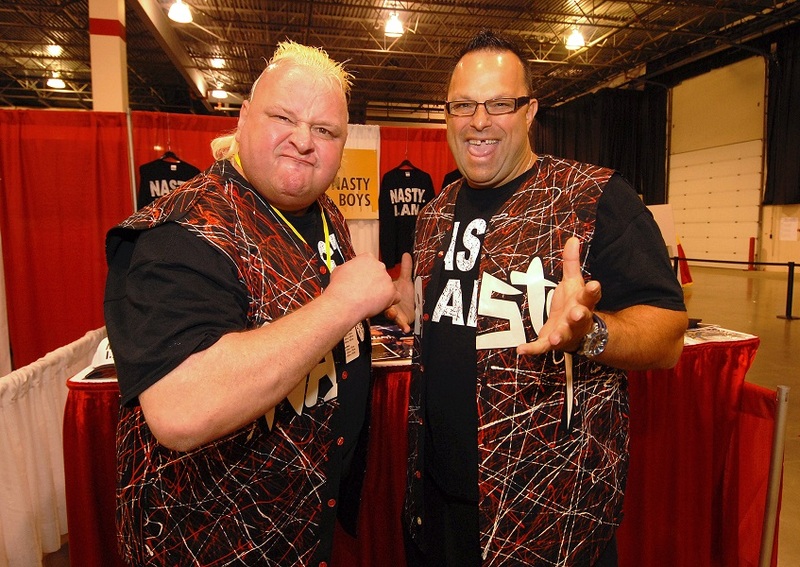 Described by Bret Hart as, “bulls in a China shop,” the Nasty Boys never tried to make anyone like them. Of course, not caring made people love to hate them. Few WWE pairings are more “of their time” than that of Brian Christopher and Scott Taylor. Initially forming the tag team Too Much, the duo bombed and went back to the drawing board. 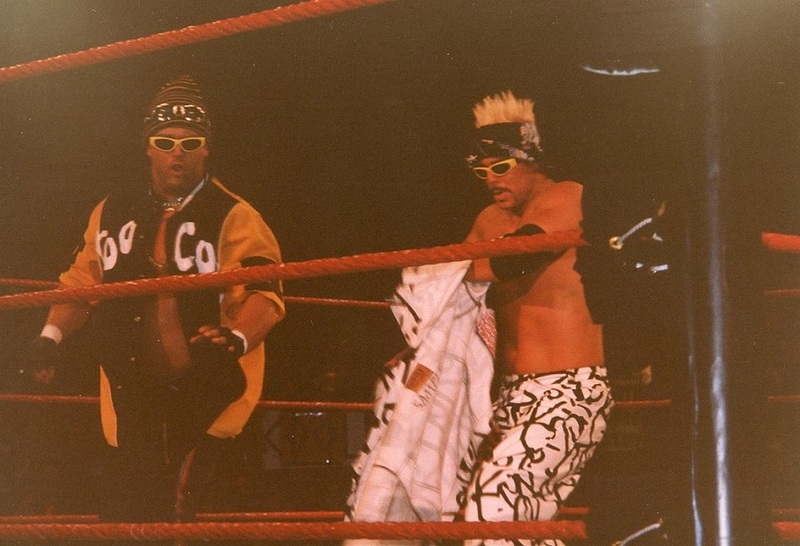 When they re-emerged they had embraced their love for hip-hop culture and individually became known as Grandmaster Sexay and Scotty 2 Hotty. As a tag team, they rebranded themselves as Too Cool and proved exactly why they left school. Armed with the power of hip-hop, Too Cool would enter the arena dancing. Of course, they proved in the ring they were more than just a funny gimmick. In 2000, Too Cool upset Edge and Christian to capture the Tag Team Title. 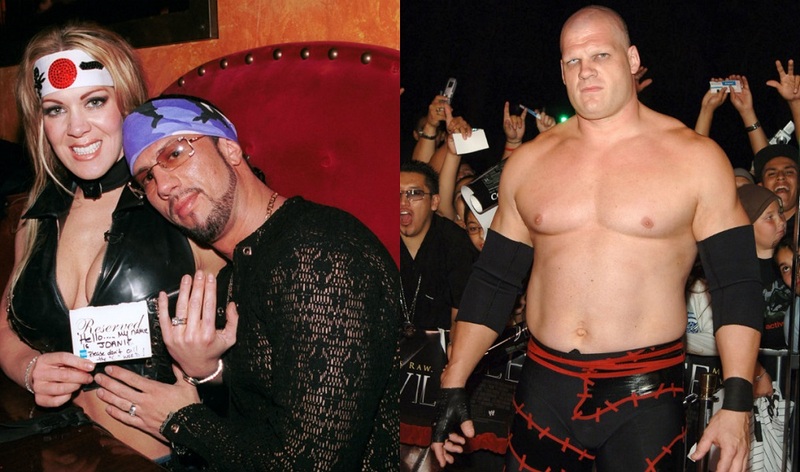 In the history of WWE, perhaps no paring was as strange and unlikely as Kane and X-Pac. The “Monster” and the “Kid” were intensely different personalities who proved the saying that “opposites attract.” The bromance was so perfect in fact, that through X-Pac’s urging, the always silent Kane started using a voice box to speak. 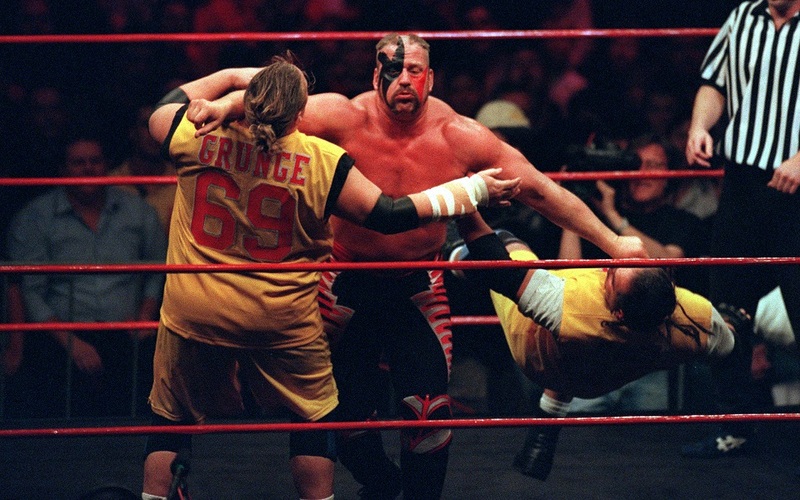 Together, Kane and X-Pac won two World Tag Team Championships, beating the likes of The Unholy Alliance and APA. Their bond seemed inseparable. That is until Tori came along. The WWE Diva tore the pair apart. 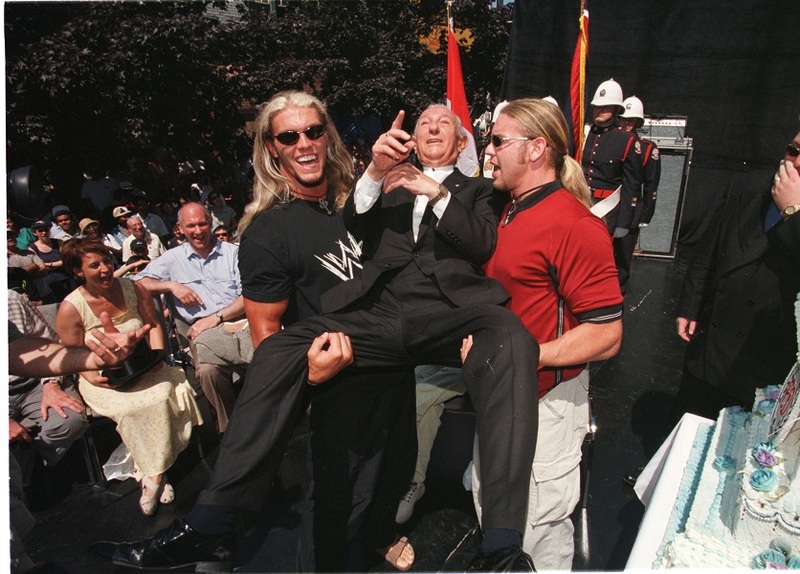 Never forget, in the WWE no bond is unbreakable when a woman comes along. Starting from humble beginnings, The World’s Greatest Tag Team took a long path before living up to their name. Entering WWE as proteges of 1996 Olympic Gold Medalist Kurt Angle, Charlie Haas and Shelton Benjamin started hot, winning the Tag Team championship after three months together. They crashed as quickly as they rose, however, and were fired by Kurt Angle in 2002. The pairs new found freedom enlivened them, and they took the name, “The World’s Greatest Tag Team.” Cocky as ever, Shelton and Benjamin proved the power of their egos and recaptured the WWE Tag Team title. Sadly, all good things must end, and they last played a match together in 2008. Born from WWE royalty, The Legacy was formed by the teaming up of Cody Rhodes and Ted DiBiase. Rhodes was the son of Hall of Famer Dusty Rhodes, and DiBiase was the son of The Million Dollar Man. Becoming a tag team lead to instant success and The Legacy was the Tag Team Title in their first-ever match together. During their incredibly successful run, The Legacy would fight the likes of John Cena and Batista DX, as well as CM Punk and Kofi Kingston. After spending three years together, they turned on each other, became enemies and disbanded in 2010. Our next team had nothing in common except their love for gold. After getting kicked out of the NWO, Booker T needed a gimmick to gain the attention of his new league. He found just what he was looking for by pairing up with Goldust. The two wrestlers couldn’t have been more different, and that’s what made them a match made in World Wrestling Entertainment heaven! The pairing of Goldust and Booker T peaked when they won a Fatal 4-Way, taking down The Dudley Boyz, Chris Jericho with Christian, and Lance Storm with Regal. After parting ways, they remained connected, with Goldust even appearing to help Booker T take down Cody Rhodes late in his career. Chris Jericho is one of the greatest WWE stars of all time. He never needed a tag team partner to cement his legacy, yet somehow he ended up with two. Originally teaming up with Edge, they won the Unified Tag Team Championship in 2009. 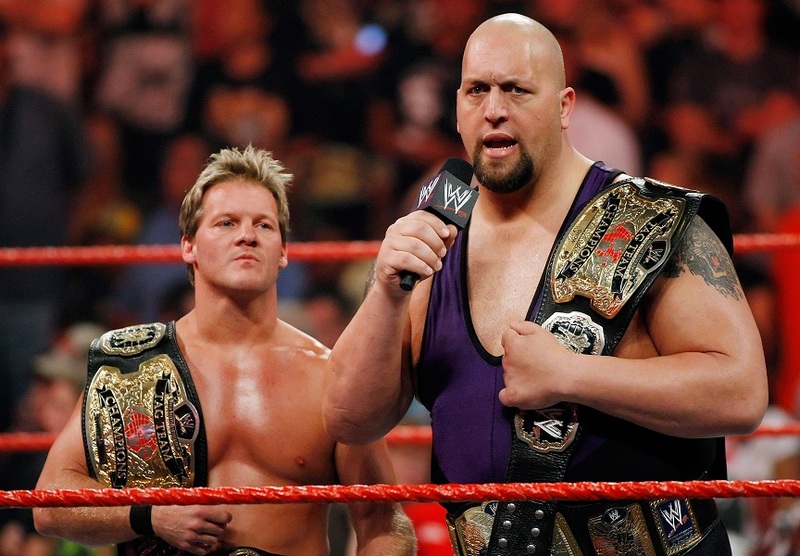 After an injury sidelined Edge, Jericho found a WWE loophole that allowed him to team up with the Big Show, forming the tag team known as the Jeri-Show. The Jeri-Show absolutely terrorized opponents during their run. Chris Jericho made it a regular practice to antagonize their opponents and set them up for Big Show. Anyone dumb enough to take the bait would end up on the receiving end of his deadly right jab. ECW tag team stars John Morrison and The Miz made their names known in the WWE during a cameo appearance in 2007. The pair battled MVP and Matt Hardy for the WWE Tag Team Championship on Smackdown, ultimately winning. They took the title back to ECW, where they successfully defended it multiple times. Despite not being in WWE at the time, the pair gained the notoriety of the league’s fans, who voted them as winners of the 2008 Slammy Award for best Tag Team of the Year. Their fame was just as quick as their success, and duo broke up in 2009. Going deep into WWE history, the Valiant Brothers deserve recognition on this list. Known as “Luscious” Johnny and “Handsome” Jimmy, the brothers exploded onto the WWE scene in 1974 and never looked back. Revolutionary at the time for their bleached blonde hair and unique brand of flamboyance, they more than backed up their image. In 1974 the Valiant Brothers captured the World Tag Team Title and held onto it for 370 days, a record at the time that would not fall for over a decade. The pair was inducted into the WWE Hall of Fame in 1996. Jimmy, pictured above, is the only member still alive today. In stark contrast with Booker T and Goldust, the Killer Bees were basically two wrestlers pretending to be one. Jim Brunzell and B. Brian Blair weren’t twins, but as a tag team duo tried their hardest to look identical. In fact, they took the gimmick so far they would even wear identical masks, allowing them to pull “switcheroos” on their opponents. In the end, the memorable Killer Bees weren’t much more than a gimmick. The pair never won a Tag Team Title despite being together for three years. It didn’t help that they existed during the tag team heyday and fought against the likes of the Dream Team and the Hart Foundation. Of course, this list wouldn’t be complete without sending some love to the ladies of the WWE! Formed in 2009, team Lay-Cool consisted of WWE Divas Michelle McCool and Layla. Almost instantly the pair became brutal villains in the league. They were so mean, in fact, that one time after an opponent retaliated, McCool kicked her in the face and Layla Tackled her into the corner. They also once famously called Mickie James “Piggie James” in the ring, causing the diva to cry and the crowd to boo. Team Lay-Cool was undeniably one of the most wicked tag teams ever in WWE, and that’s exactly why we loved, and hated them, so much!